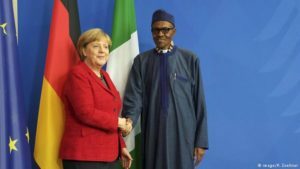 German Chancellor Angela Merkel is undertaking this week a tour of three West African countries, namely Senegal, Ghana and Nigeria. The Chancellor is accompanied by a large economic delegation, deputy government spokeswoman, Ulrike Demmer said ahead of her trip. “All three countries face huge challenges when it comes to economic and social development,” the spokeswoman said. The three nations are considered important dialogue partners for the German government, particularly in stemming migration and boosting the fight against jihadism, and there is a need to strengthen and shape their economic growth to benefit all citizens, the official added. Merkel has placed a strong focus on African diplomacy in recent years, and has called on African countries to do their bit in stemming the flow of migrants to Europe — an issue over which she faces criticism at home. Like China and more recently Britain’s Theresa May, export-nation Germany is also eagerly eyeing the burgeoning economic potential of resource-rich African nations with young, dynamic citizens. After her talks in Dakar Wednesday with President Macky Sall on his country’s economic development and on regional cooperation, Angela Merkel will hold a meeting in Accra with Ghana’s President Nana Addo Dankwa Akufo-Addo Akufo this Thursday. Talks are expected to focus on ways to bolster German-Ghanaian ties, as well as on the two countries’ cooperation in addressing the challenges of sub-regional security and migration issues. After her meeting with the President, Chancellor Merkel would participate in a German business-organised round table that will focus on private investment linked to the G20 “Compact with Africa” initiative. On Friday, Merkel is expected in Nigeria where she will first meet with the president of the Economic Community of West African States (ECOWAS), Jean-Claude Brou, to discuss cooperation between Germany and the community of 15 countries. She will later meet with Nigerian President Muhammadu Buhari. Last year, Merkel visited three African countries before hosting leaders from Chad and Nigeria for talks in Berlin. Germany’s foreign trade with sub-Saharan Africa amounted to about $30bn last year, according to German Trade and Invest (GTAI). Imports from sub-Saharan Africa accounted for only 1.1 percent of total foreign trade in 2017. Posted by Emmanuel Agbenonwossi on August 30, 2018. Filed under News. You can follow any responses to this entry through the RSS 2.0. Both comments and pings are currently closed.